ETF managed portfolios are funds or mandates that invest at least 50% in ETFs. -What he sees for the development of the ETF market in the future. Morningstar senior fund analyst Al Kellett will provide an introduction to what the term ‘smart beta’ means, and start off this webinar by taking a look at the smart beta ETF landscape, how big this subset of the ETF market is and how it’s been growing. He’ll then illustrate why it’s hard to define and discuss some of the ways that this strategy is being carried out right now in the marketplace. Morningstar ETF experts Hortense Bioy, Jose Garcia-Zarate, Al Kellett and Gordon Rose will answer all your ETF questions, no matter how big or small. Submit your questions in advance at ETFQueries@morningstar.com or live on the day via the BrightTALK webinar platform. We’ve already got a list of your questions to address, including how dividends are treated in ETFs and what impact this could have on performance; what costs are associated with ETFs beyond the total expense ratio; how to tell how actively traded an ETF is; and how to decide which ETF to buy when faced with several products tracking the same index. What exactly are these alternative beta strategies? Are they better than the traditional market cap-weighted approach or just different? How can these strategies be integrated into one’s investment process? The agenda will be to define the terms Tracking Error and Tracking Difference and talk about why they are important; to present the results of our study into the tracking efficiency of a sample of ETFs; and introduce a new Morningstar data point for measuring tracking efficiency, Estimated Holding Cost. Why even consider the alternatives? Why use ETFs to access alternative asset classes? - What safeguards are put in place to protect investors? - How much of your physical ETF is out on loan? •Are commodities a diversification goldmine? •Are some commodity indices better than others? Would Spain be better off outside the Euro? 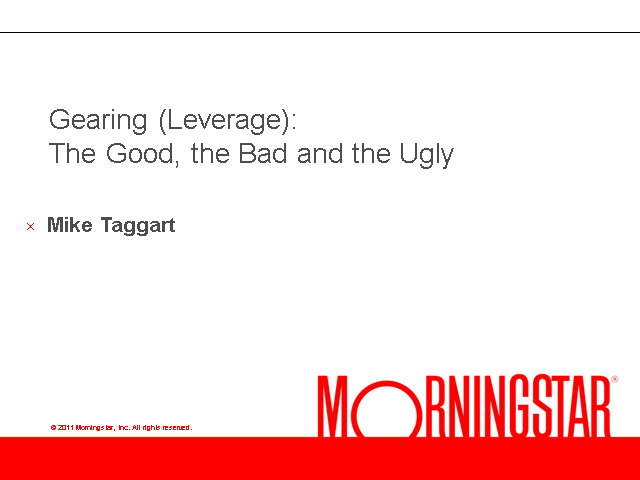 The March edition of Morningstar's monthly ETF webinars focuses on combining these passive investment vehicles with their active counterparts in a diversified portfolio. Morningstar invites you for a discussion about mid-caps: are they really under-researched and offer superior returns? - Do Mid-Caps Offer Attractive Risk/Return Characteristics? - Are Mid-Caps Under-Researched And Under-Represented? - What drives mid caps performance relative to large caps? - How can I access mid caps? - What are the sources of counterparty risk in ETPs? - How are investors being protected from this risk? - How are they being compensated for assuming this risk? - How is the industry addressing concerns over these risks? - What more can be done to further illuminate and mitigate this risk? Morningstar.co.uk invites you to quiz our independent analysts on a different topic every few weeks as they discuss investment trends, share ideas and update you on industry developments.